I was sadly unable to actually meet Emma Leah of Fleurage Perfumes when she was briefly in Los Angeles, which is too bad. But she did send me samples of her latest work, her eaux de cologne. There are 8 of them, I’ll look at four of them this week and four next week. 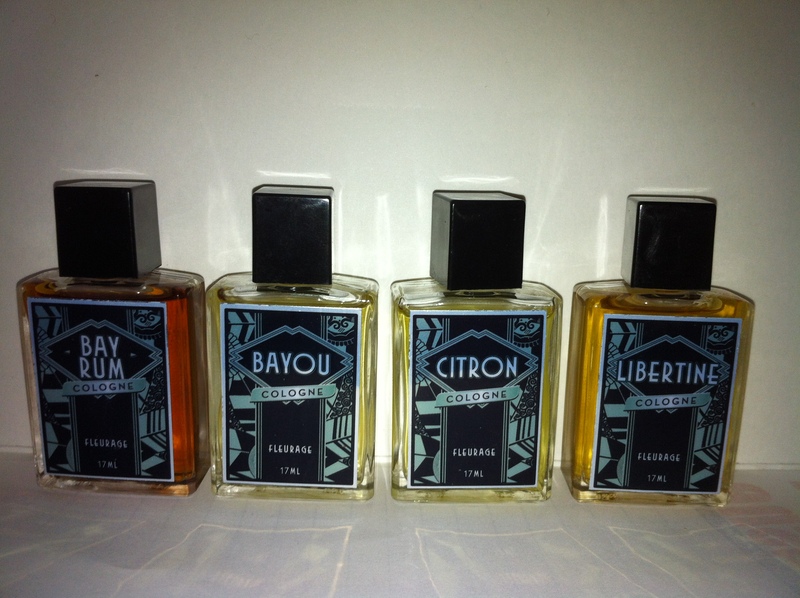 The ones for this week are Libertine, Citron, Bayou and Bay Rum. Libertine is a “musky spiced floral.” I get an immediate note of sweet cherries- not like cherry cordial, more like maraschino cherries along with neroli. It so should not work but is absolutely delightful. Slowly a musky amber joins in as the cherry sweetness fades and that’s what the final drydown is- a dashing combo of neroli, amber and a touch of musk and it’s not listed but I think it has a touch of rose. Very nice. Citron is “the Amalfi Coast if Italy, home of Limoncello.” It lists notes of neroli. mandarin, lemon and lime and smells at first like a cool limoncello, then further in exactly like those lemon candies I used to buy in a tin and could eat, one by one until the tin was empty. As it matures on skin, the different citruses separate a little and the neroli becomes more of the show. Lasting power is really good on this one, especially considering it’s A) citrus and B) cologne. Bayou is described as “The mysterious depths the sweet night air is filled with honeysuckle smoke and tobacco- southern gentleman sipping bourbon on a balcony of a southern mansion surrounded by tree moss, honeysuckle and jasmine.” Well, that’s a mouthful. I definitely get the smoky-woody-resiny thing in the opening that starts to get greener as some of the flowers come out to play. I sort of wish this one didn’t lose so much of the opening on it’s way into the suave dry-down. But is a cologne after all. Bay Rum is “pirates” and “traditional spices.” It’s also a reminder of how good real Bay Rum is. Most people if they’ve smelled it at all have only smelled the stuff that comes in gallon plastic jugs and are used in some of the lesser barbershops. This is rich, spicy warm scent that starts of with almost meaty clove then starts adding in allspice vanilla and unlisted mace. By far my favorite so far, and by far the longest lasting. Now the bad news: I have no info on pricing or availability or where they’re going to be sold. They aren’t even on her website yet. I assume that when she was in Los Angeles that she presented to the boys at Luckyscent. I really hope they will pick up some of this line. Like her perfumes, they are brilliant. My samples were a gift from the perfumer. Image credit: my iPhone. MMMM, i love Bay Rum scents. I have a couple and am always loking for a new fix. I too love a good bay rum, especially on my husband. The cherry one sounds intriguing, too. With you, Rosarita et al – a good Bay Rum is the stuff of legend! The lemon sounds good, too! Tom, these sound so nice. Hope Luckyscent (or someone) will pick them up soon.